I’ve been getting updates from my daughter Shannon in North Carolina. A snowstorm is heading her way—six to seven inches are predicted—and it’s already throwing people in a tizzy. 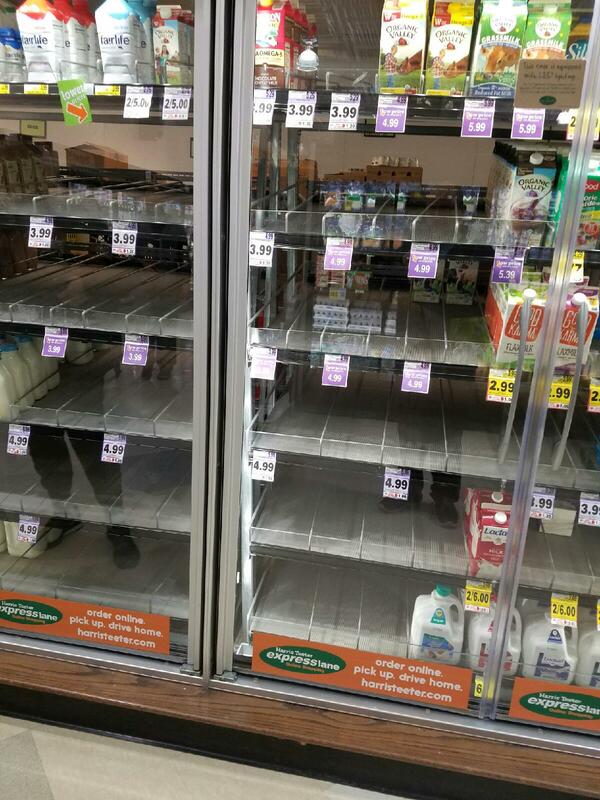 Yesterday, my son-in-law, Mike, took this picture of the milk case in a grocery store in North Carolina. “It’s not suppose to start until later this afternoon/early evening and is most likely going to be rain at first and then mixed precipitation (yay!) so hopefully our commute home won’t be too bad. The main event is going to be later 11pm-midnight and at that point it’s going to be all snow – and then it’s suppose to continue through mid-day Saturday. We’re smack dab in the 5-7 inches range right now. Our new governor has declared a State of Emergency for all counties in NC and after school activities were already being canceled yesterday for most and the rest did so this morning. Now, I realize the South is unprepared for any kind of snowstorm at all. They simply don’t have the equipment to deal with snow, a rare event in North Carolina. However, as a Mainer, it’s a little hard to understand getting upset about only six or seven inches of snow, and it almost seems as though Shannon and Mike have moved to a foreign country. 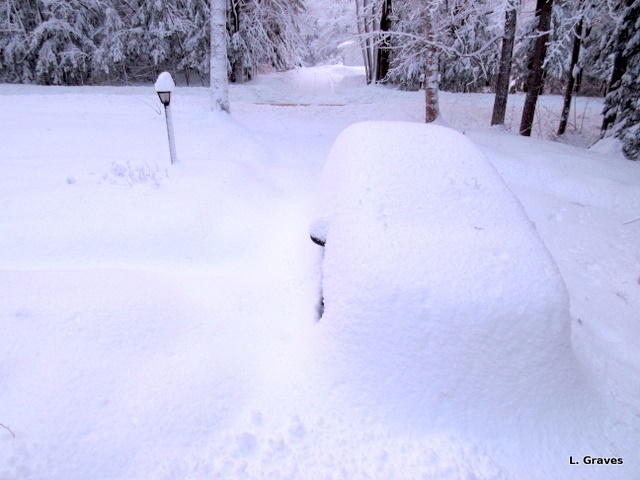 As my daughter pointed out in another email, we got a foot of snow the night before she and her husband were supposed to leave Maine and head back to North Carolina. In the morning, within an hour, the driveway was cleared enough for them to leave, and the roads were well plowed. Shannon and Mike left when they had planned and had no trouble driving. This has made me reflect that when you live in Maine, you have to be adaptable. The seasons rock between extreme cold with snow and ice to extreme heat and humidity. We have to be prepared for it all, and I must admit that I take pride in being able to do so. This adaptability leads to a certain flexibility as well as a can-do attitude. While we Mainers certainly take the weather seriously—nowadays, all people should take the weather seriously—we feel as though we can cope with the extremes. In my pantry are cans of soup and baked beans. There are also buckets of water in the basement in case the power goes out. We have propane for our little camp stove, and lamp oil for our lanterns. We even have extra batteries for our flashlights. And to Shannon and Mike and all in the South who are the storm’s path, stay snug and warm and safe. All right. That’s starting to sound like a bit of snow. Hope everyone is safe and warm. Funny the perspective you get – We live in the country with well water (which is useless if the electric goes out) so we always have big bottles of “flush” water stored – all year. Snow is handled pretty well here (New Jersey) – but not like you guys do it! Well, we’ve had lots of practice 😉 Really, even a foot doesn’t cause much alarm, unless of course there’s freezing rain mixed in. Mainers, especially those who remember the Great Ice Storm of ’98, hate freezing rain. If you wrote for a large newspaper, Laurie, I would buy a subscription. I like the way you tell a story and make us feel like we know how they feel, then you add the other side of the coin. Lovely writing. That near-empty cooler does say it all. It must be — for us Easterners — like when Vancouver gets huge amounts of snow. They can’t believe it, and we feel sorry for them — but only for a moment! People in the South do tend to get bent out of shape when even a litle snow falls. They are just not accustomed to it.